HCP Packaging specializes in complete beauty solutions for mascara, including fiber and micro-injection plastic brushes, stock and custom packs as well as extensive decoration capabilities; ensuring packs are as beautiful as they are functional. Full pack manufacturing is offered from China, Germany, U.S.A. and Mexico. Innovative brushes are produced in Hinsdale, U.S.A. and Bechhofen, Germany, with plastic brush experts SIMP in Paris; HCP offers global brands a full mascara solution, supported by strong engineering and technical expertise. HCP partners with global mascara fillers to ensure pack, brush and wiper combinations are highly effective with the latest mascara formulas. HCP’s center of excellence for twisted wire brush development and manufacturing in Hinsdale utilizes a combination of a high-tech twisted wire brush and multi-contour trimming machines for the efficient production of high-quality innovative fiber brushes. The addition of a twist or multiple twists to any contour brush profile provides mascara brushes with complex surfaces, which increase the combing effect and product loading. HCP’s European facility offers mascara expertise with extensive twisted wire brush development. A key innovation, patented Spider Technology is a special surface treatment creating microscopic spheres at the fiber tip for enhanced volumizing results. Mascara brushes are available with a variety of Spider Technology designs, with single or multiple reservoirs, applied up to 360° around the brush or in a spiral formation. Providing mascara beauty solutions through the optimization of micro-precision molded plastic mascara brush and wiper, SIMP technology helps to deliver excellent make-up results for lashes and a best-in-class time-to-market. Combining SIMP expertise with HCP global full pack manufacturing provides a compelling proposition for mascara. HCP’s design capability combines with SIMP’s strong technical expertise to build on the already innovative brush designs available and will continue to launch new cutting-edge options for lash application systems. 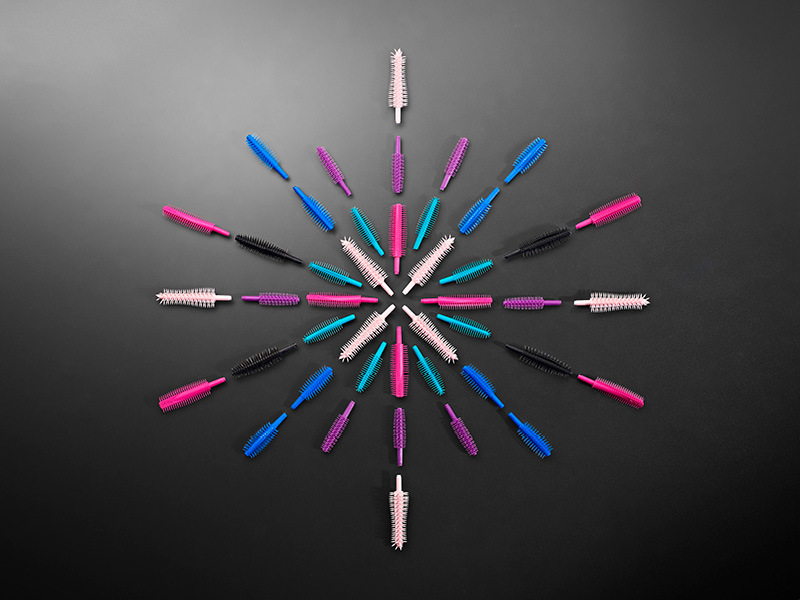 SIMP’s innovative micro-precision plastic mascara brushes combine intricate construction with many customizable features such as material, color, accessories and variations of the overall design. HCP has drawn upon its global mascara expertise to develop the Pacific mascara, a stock pack with a luxurious tapered profile and a gently sloping tear-drop surface to the cap, compatible with fiber and precision micro-injected plastic brushes. With extensive decoration capabilities, this is a stand-out star of HCP’s mascara offering. 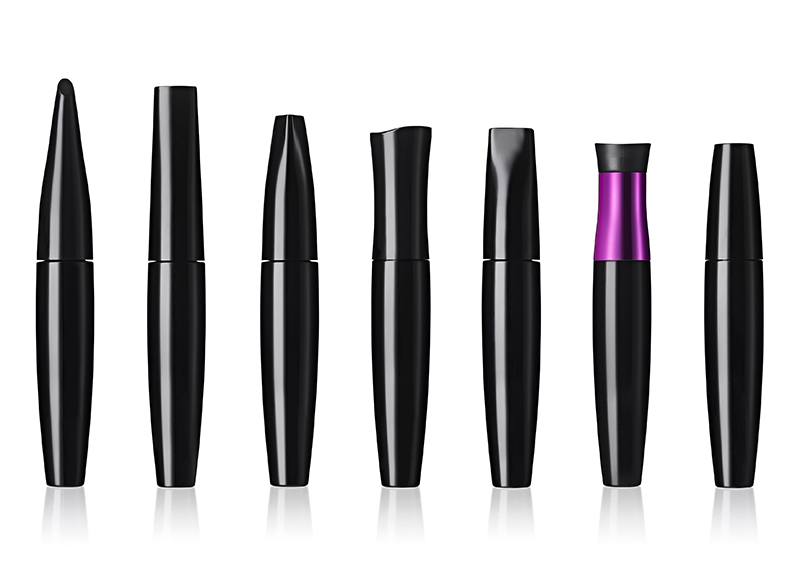 Shown here with a variety of stylish metallization and spray finishes in a spectrum of cool hues, the Pacific mascara is a highly transformative choice for all brands. Stock packaging is an ideal solution for brands looking for speed-to-market when time and budget constraints don’t stretch to custom designs. But how can a brand differentiate from the competition, attract the consumers’ eye and ensure a cohesive look with the full range? Modular packaging provides many style choices. Brands select from various cap shapes to bottle profiles and applicator systems to match the brand aesthetic. Flexible results: Fast!